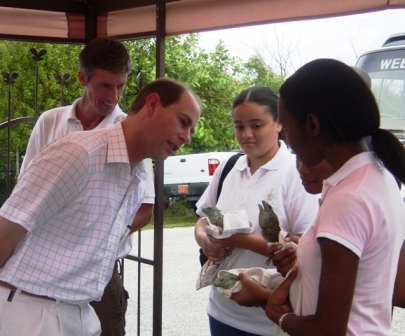 England's Prince Edward today toured a Cayman Islands neighbourhood rebuilt after a hurricane in 2004 and watched the release of three rare blue iguanas. The John Gray Recyclers were honoured to be chosen to show Prince Edward the three young Grand Cayman Blue Iguanas to be released into the Salina Reserve. The picture below shows Melissa Smith, the John Gray Recyclers' President, and Community Member, Chantal Pearson, Community Member, and Gloria Borden, a year 11 student at the John Gray High School. They then went into the Reserve with Mr Fred Burton, the Director of the Blue Iguana Recovery Programme and released the iguanas.